Dimensions 0.75 by 5.31 by 8 in. 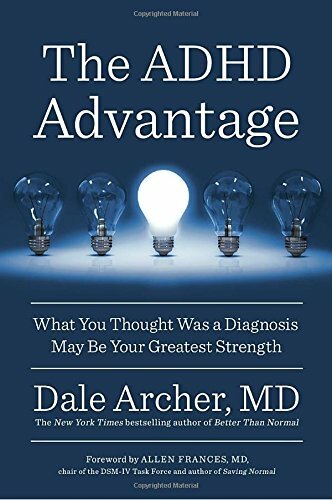 Amazon.com description: Product Description: The New York Timesâbestselling author of Better Than Normal, esteemed psychiatrist Dale Archer, M.D., reveals how ADHD might be the key to your success. For decades, in the United States and in countries around the world, physicians delivered the diagnosis of ADHD to patients as bad news and warned them about a lifelong struggle of managing symptoms. But The ADHD Advantage explodes this outlook, arguing that some of the most highly successful entrepreneurs, leaders, and entertainers have reached the pinnacle of success not in spite of their ADHD but because of it. People with ADHD are restless, endlessly curious, often adventurous, willing to take smart risks, and unusually resilient, and their ranks include some of the greatest entrepreneurs of our time. Sharing the stories of highly successful people with ADHD, Archer offers a vitally important and inspiring new way to recognize ADHD traits in oneself or in oneâs loved ones and then leverage them to great advantage. Readers will learn to harness mental energy for greater creativity, embrace multitasking, and build a path to great successâwithout medication. As someone who not only has ADHD himself but has never used medication to treat it, Dr. Archer understands the condition from a unique professional and personal standpoint. Armed with new science and research, and his own personal experience, he teaches readers to embrace their natural strengths and innate potential.